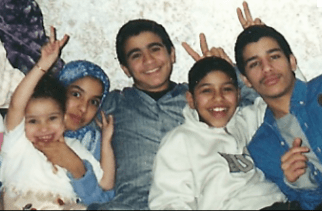 Omar Khadr (centre in the picture) was born in Toronto, Canada on September 19, 1986. His father was an Egyptian born Canadian who ran charities to provide food and education for orphans, and was an old friend of Osama Bin Laden. His mother was a Canadian of Palestinian descent. Omar spoke four languages fluently. When he was 15, his family sent him to accompany a group as a translator. 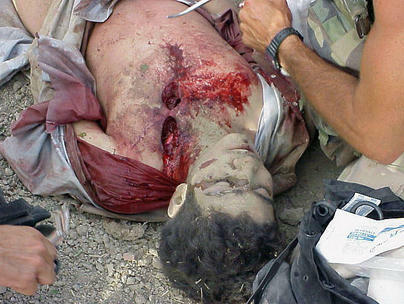 The US military identified that group as Al Qaeda. Not only was Omar given no consideration for his age, he was “treated worse than anyone else” according to cellmate Moazzem Begg. Australian prisoner David Hicks wrote, “On one occasion, I saw US soldiers dragging Omar from his cage to a room used for interrogation just opposite from mine. For at least an hour, I heard him scream and yell in pain as they abused him. Omar was yelling, ‘Why are you doing this? … Please stop. … Somebody help me!’ There seemed to be no point to this brutality except to hurt him and break his will.” He was also reportedly drugged, subjected to extreme temperatures for long periods, and refused basic medical treatment including the removal of shrapnel from his wounds.